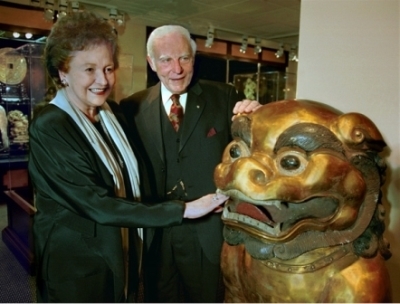 Mr. Jack Belz, chairman and CEO of Belz Enterprises, and his wife Marilyn, began collecting Asian art in 1968 when the couple wandered into an Asian art gallery in Los Angeles. After several years, their collection had grown significantly. It wasn’t until 1995 that the idea for a museum sparked. That year, Jack Belz had agreed to donate some of their collection to a temporary exhibition at the Pink Palace Museum in Memphis. The display was part of a complementary exhibit to the Wonders: Imperial Tombs of China exhibition taking place at the Cook Convention Center. By 1998 the foundation had been established and the museum was originally named Peabody Place Museum. Today, the collection at Belz Museum serves as a testament to their love of collecting. "Our planet is home to a marvelous diversity of cultures with rich artistic and historic legacies. The intricate creations of Chinese artists rank among the most inspiring. These artworks are frequently crafted of rare and precious materials, which reveal an enormous patience and painstaking execution. Belz Museum seeks to engage visitors in a unique cultural experience through the presentation of the museum’s collections, temporary exhibitions, educational programs and the care and preservation of the museum’s permanent works of art. 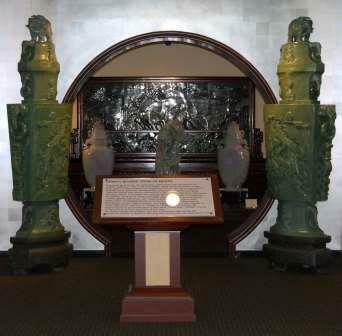 Did you know that Chinese craftsmen often worked for decades to create a single jade sculpture? Did you know that Belz Museum is home to one of the most extensive collections of 19th Century Chinese art in the country? Could you carve a chain from a single block of stone? Ancient Chinese craftsmen mastered this feat with jade, a material that is as hard as steel. Did you know that to the Chinese craftsmen valued ivory for its color? Unlike other types of bone, over time ivory develops a rich and beautiful patina that is highly prized by collectors. Chinese ivory carvers created intricate objects from the tusks of Asian elephants. Many concentric balls, known as “mystery balls”, were produced for export to the west during the 17th and 18th Centuries. One of the original pieces in the collection, the mystery ball in the museum has 42 concentric balls (one inside the other) carved from a single piece of ivory. Did you know that cinnabar lacquer is made from a derivative of mercury and is a highly toxic material? Red was considered highly auspicious to the ancient Chinese. Cinnabar was also thought to have magical properties. The museum has many examples of lacquer that include period furnishings. Did you know that the Qing Emperors revived the tradition of having auspicious symbols embroidered onto their ceremonial garments? Taking inspiration from many sources, Qing garments were highly decorative. The yellow robe on display at the Belz Museum is a very detailed example of court clothing. Did you know that snuff is a finely ground form of tobacco that was inhaled through the nose? Tobacco was introduced into China by Jesuit Missionaries. Once used for medicinal purposes, the practice of inhaling snuff had become fashionable by the Qing Dynasty. The examples of snuff bottles on display in the museum range from very simple to very elaborate. Did you know that the practice of installing temple lions at the entrances of important buildings originated during the Ming Dynasty? This practice continued well into the nineteenth century and symbolized guardianship. The well-crafted pair of cloisonné temple lions that guard the entrance to the museum once stood watch in the Forbidden City in Beijing. Scholar’s rocks are sometimes referred to as worlds within worlds. Collected for their beauty and contemplative features, these natural stones would be mounted on wood stands and displayed in the studios of learned men.